Depending upon material characteristic & available room atmosphere only. Pre-pressure and Main pressure could be changed depending upon the size of the compress and filling depth, Powder or granulation.It is dependent on the physical specification of the used material for the compress. 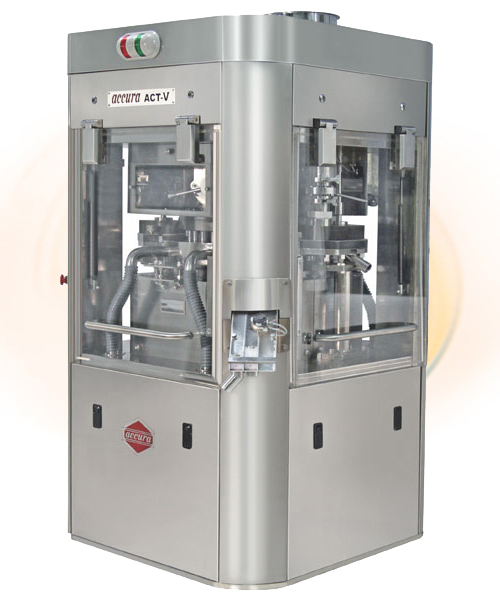 A tablet press machine is an electro-mechanical device that transforms powder into tablets of uniform sizes and thickness by using compressive forces. 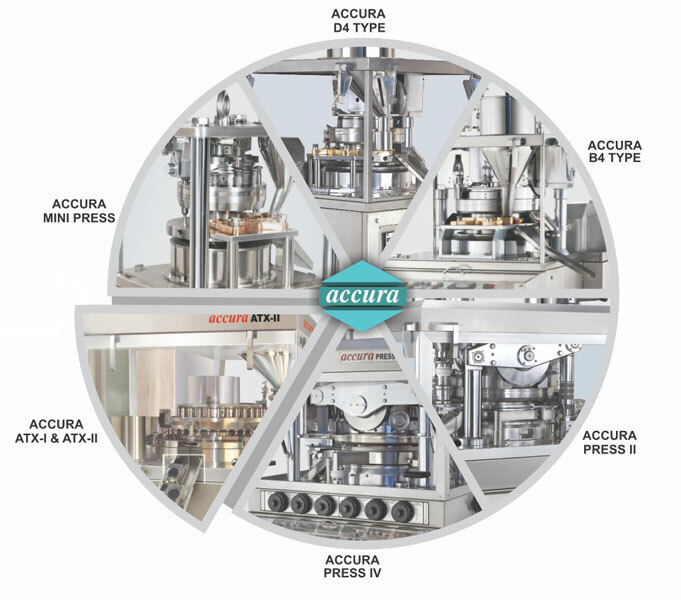 Fluidpack brings to you Tablet Press Machine – High Speed Double Rotary Tablet Press (“ACCURA” MODEL ACT-V) to speed up the tablet press process giving high yields. The output of the machine can be up to 3,38,400 Tablets / Hour. 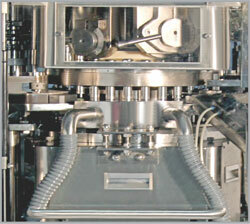 The machine has a sturdy build up ensuring the machine can perform the operation of pill press for longer durations. The structure of the machine is fabricated in a manner to ensure the operation without any vibration. The pre- pressure and main pressure of the pill pressing machine can also be regulated allowing you to vary the raw materials for the operation. The above specification and Features of the Machineries are subject to change without any prior notice for the technicaldevelopment. Motorized dozer, for precise dept of fill adjustment is with this pill press machine. With PLC & Colour MMI Touch Screen on Separate Operating Pannel. This Tablet Press Machine is Four sides open with upper Guards. Control panel is separate. Power Main motor 15 Hp.